Russian and American Fulbright Program Alumni are actively involved in the life of their Russian home Universities and Fulbright community in general. 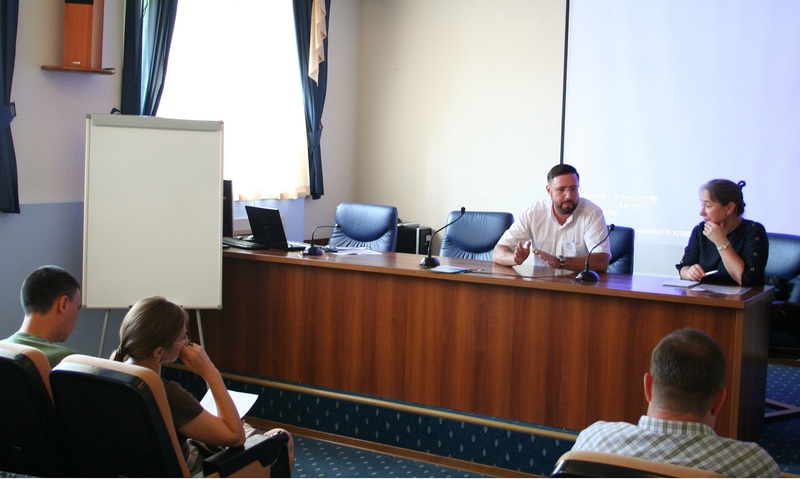 Last summer the Medical Fulbright Summer School called “Academic Writing and Public Health Engloholics” welcomed lectures from Evgenia Piatovskaya (FLTA) and Jared Palazza (ETA). A special 2-day event for the local Fulbright Russian Alumni was held as part of the School. All in all about 20 alums (FLTA, RIEA, FFDP, Visiting Scholars) from Tomsk, Barnaul, Biysk, Kemerovo and Khanty-Mansiysk gathered to participate in the event. They represented different universities and fields. The Round Table of the Russian Alums was open for all participants and lecturers of the Summer School, and it focused on the experience of Fulbright program alumni in the sphere of publications in international peer journals. The Head of Department of General and Biological Chemistry Dr. Korenovskiy Yu. (Altay State Medical University), Associate Professor of Department of Internal Diseases Tetenev K. (Siberian State Medical University), doctor-otolaryngologist Candidate in Medicine Litvak M. (Tomsk Polytechnical University), Senior Faculty of the Foreign Languages Department Demidova O. and other alums shared their experience with colleagues. Alumni who could not physically take part in the event, submitted their power-point presentations on the topic. Great appreciation was expressed by the audience for the skype presentation of Doctor in Biology, professor Zinoviev A. (Head of a Department of the Tver’ State University) from the Abramtsevo Estate. The Alumni were also acquainted with the Moscow office and US Embassy initiatives targeted to support alumni activity like Small Grants, Summer Schools, options to host US Fulbrighters, etc. It was a real pleasure to see the urge of the alums working at different Universities to cooperate with each other. The Round Table was followed by informal talks at the reception. The Summer School participants were interested in learning more about opportunities for carrying out research, lecturing, publishing, attending professional conferences once they become Fulbrighters; they also expressed keen interest in Alumni projects upon return to Russia.